Looking for an easy and healthful lunch for the home or office? This is one of my favorite recipes — and it’s totally vegan. It comes from the January 2008 issue of Martha Stewart’s Everyday Food magazine and was also featured on the Today show. It’s infinitely variable; if you don’t happen to have cauliflower on hand, you can substitute another vegetable that roasts well, like bell peppers, or eggplant, or zucchini, or sliced onion. I like including whole garlic cloves. The arugula is nice, but totally optional. 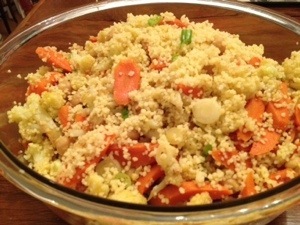 And when I made this dish for lunch today, I substituted quinoa for the couscous, and it works perfectly! Feel free to vary this to your own taste, and enjoy. Preheat oven to 450° F. Divide carrots and cauliflower between two baking sheets; toss with cumin and two tablespoons of oil; season with salt and pepper. Roast, tossing occasionally and rotating sheets from top to bottom halfway through, until vegetables are browned and tender, 25 to 30 minutes. Let cool to room temperature. Meanwhile, in a medium saucepan, bring 1¼ cups water to a boil. Salt generously and stir in couscous; cover and remove from heat. Let stand until tender, 5 minutes. Fluff with a fork; set aside to cool, uncovered. In a small bowl or liquid measuring cup, whisk together lemon zest, lemon juice, and remaining tablespoon olive oil; season with salt and pepper. In a large bowl, combine roasted vegetables with couscous, chickpeas, and scallions. Place arugula on plates and drizzle with about 1 tablespoon of dressing. Toss remaining dressing with couscous mixture, serve on top of arugula. Serves four. Prep time: 30 minutes. Total time: 60 minutes. This entry was posted in Main Courses, Salads and Sides, Vegan, Vegetarian by Baron. Bookmark the permalink. My brother is gluten-free so I might try this with quinoa instead of couscous, YUM!